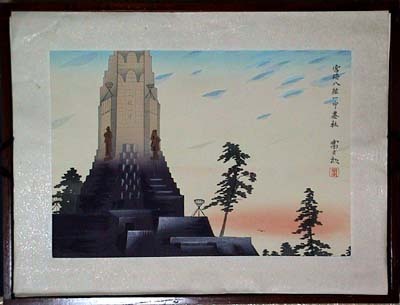 Published by Uchida on 20th September, 1941, this 50-print set by Tomikichiro Tokuriki contains scenes from Japan's most sacred and historic shrines, temples, castles, and other various man-made and natural structures like bridges and waterfalls. 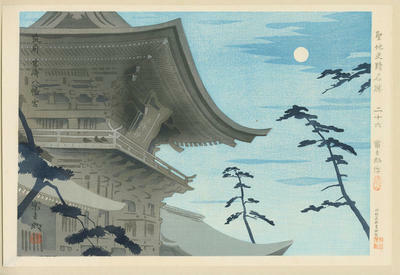 This set was republished in 1988, but using machine printing (not the woodblock process). I have been fortunate enough to obtain a complete set of prints from this series. Each print is housed in a mica-impregnated folder (lightly attached in two places on the verso) with a sheet of tissue paper separating the front of the print from the windowed front of the folder. The 50 folders are housed in their original lacquered wooden box with tatou-like folding covers. Included with the prints is a traditionally-bound 110-page booklet about the series, printed on washi paper and containing details of each of the 50 scenes, including monochrome photos of each print. 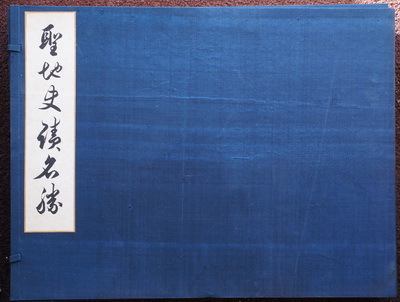 Also included are several cardboard inserts and prints containing words and verses in traditional 'Shodo' Japanese calligraphic style, which I have not had time to translate yet. In all, a very beautiful and complete set in very good condition. 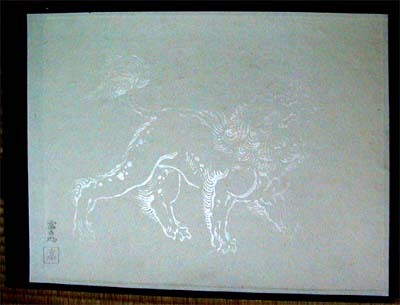 Left - Lift-out cover of the wooden box which holds the 50-print set. Right - Prints in the box. 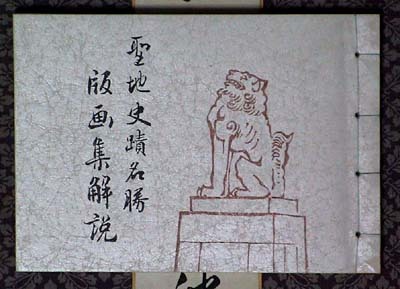 Left - Front cover of ~110-page book which details the complete series. 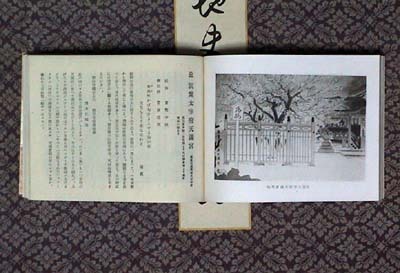 Right - An example of one entry in the book, showing a print in monochrome along with a full-page summary of the scene's historical significance. 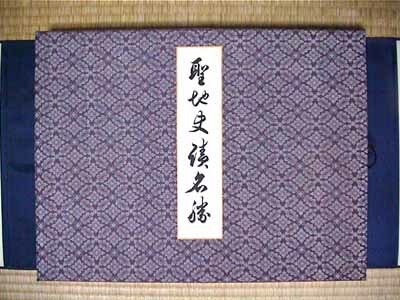 Complete view of the wooden box with the two tatou covers opened. The complete 50 prints can be easily removed using the material loops at each side of the box.